Yaa Gyasi’s debut, Homegoing (PRH/Vintage; RH Audio; BOT; OverDrive Sample), was a hot manuscript, attracting multiple bids from publishers. The novel went on to win an impressive array of awards. Now in paperback it is being picked up for One Book programs. Becoming a One Book pick, which can significantly boost sales and give a title lasting power over many years, is just the next on a long list of high points for Gyasi. The book won both the National Book Critics Circle’s John Leonard Award for best first book and the PEN/Hemingway Award for a first book of fiction. The author is a Five Under Thirty-five honoree by the National Book Foundation and one of Granta‘s Best of Young American Novelists, a list they issue once a decade. Homecoming was both an Indie Next selection and a LibraryReads pick. It was also a Librarian favorite for 2016. We did a review roundup when the hardback was published. As a result, several titles have been dropped, reports a syndicated story by the AP, including a staple of One Book programs, Harper Lee’s To Kill a Mockingbird, as well as poetry by Emily Dickinson, Ray Bradbury’s Fahrenheit 451, F. Scott Fitzgerald’s The Great Gatsby, and John Steinbeck’s The Grapes of Wrath. 13 titles have been added. Among the new entries are more works by women, works in translation, poetry, short stories, memoirs, as well as genre titles. Updated selections for three authors already on the list, Louise Erdrich, Marilynne Robinson, and Tobias Wolff, are also included.. The full list of Big Read titles is available online. The grandmother of all One City/One Book programs in the US, has chosen Karen Joy Fowler’s We Are All Completely Beside Ourselves (PRH/Putnam/Marian Wood, 2013; also in trade pbk) as the 2016 title. Seattle Reads began the One City One Book reading programs that swept the country over a decade ago. Fowler will visit Seattle in May for a two-day event. After successful showings in New Mexico in September, the indie film adaptation of Rudolfo Anya’s 1972 novel, Bless Me, Ultima, (Hachette/Grand Central), expands to over 200 U.S. theaters on February 22nd. The trailer calls the book “controversial.” While it has been removed from high school classrooms in some areas of the country, it is also one of the titles on the NEA’s Big Read list and has been picked by many “one community read” programs. I have always been skeptical of these programs, wondering “Can one book really fit all?” But then, along comes one that does — Wonder by R.J. Palacio RH/Knopf, 2/14/12). Wonder is the first book that I have read in years that deserves to be a One Book, One School read, so Bank Street will be using it for our very first One Book, One Bank Street program. We are urging students, teachers, faculty, parents, and alumni to read this moving book about a 5th grade class who must examine how they treat Auggie, a bright, boy with a frightening facial deformity who is going to school for the first time. It is an un-put-down-able, gender-neutral story that gives an authentic voice to the relationships between sibling, friends, and parents. I can’t think of a book to compare it to and, given the number of books I’ve read during my career, that’s saying a lot right there. Choosing a new hardcover seems like an expensive proposition for such a program, but this is a book that will stand the test of time. Our school will begin reading it aloud to 3rd and 4th grades in September. I am buying classroom sets for 5th and 6th grades to read in September/October. They will then be passed up to 7th and 8th grade in November. We will be blogging about the successes and pitfalls of the program and the reading/literacy/social curriculum that arises from the experience. The publisher is supporting the book with various materials, including a readers guide, and terrific choose kindness campaign. I loved Wonder. It is a wonderful novel about kindness and not judging people by their looks. The reader forms an incredibly strong bond with the main character, August Pullman. August is not an ordinary ten-year old. As he says, “ordinary kids don’t make other ordinary kids run away screaming in playgrounds.” August was born without a jaw, with eyes too far down his face and missing external ears. Sheltered his entire life by his parents, he did not attend public school to avoid the shock and disgust on other children’s faces. However, his parents force him to enter fifth grade because they cannot homeschool him well enough for him to take advantage of his superior intellectual capabilities. The plot so captivates the reader that Wonder must be read in one sitting. Wonder is inspiring because it shows that regardless of a person’s looks, a person should be treated the same as everyone else. Wonder explains life through the eyes of a person whom society casts as an outsider and the book reveals that, even today, looks are given far too much importance. Also, Wonder describes how people interact with people with disabilities and how they overcome their prejudices. The Chicago Tribune announces that the next One Chicago/One Book pick is Neil Gaiman’s Neverwhere. The story notes that Chicago’s Mayor Daley is very involved with the program and becomes positively “giddy” when he learns about the latest selection. Daley, who is retiring after 22 years, will be replaced by Rahm Emmanuel. The Tribune writes that Daley’s largest cultural legacy is likely to be his support of the city’s libraries; 59 were built during his time as mayor with four new ones opening by the end of the year. The grandmother of all One City/One Book programs in the US, Seattle Reads, has chosen Chris Cleave’s Little Bee as their 2011 selection. 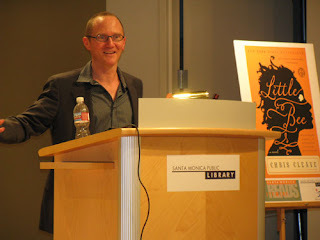 The author, who lives in London, will come to Seattle for an appearance at the library in mid May. Santa Monica selected the book in February of this year for their 2010 program (there’s an EarlyWord connection; Robert Graves, Public Services Librarian at Santa Monica Public Library generously credits EarlyWord as being the first place he heard about the book); the entire program, including a visit from Cleave, was a resounding success. It hardly seems a coincidence that the trade paperback edition of the book went on the NYT best seller list the next month, where it’s remained in the top 4 ever since, rising to #1 for three weeks. The Seattle program may be having a similar effect; yesterday, the day after the announcement, the book jumped up the Amazon sale rankings to #32, from #79 the day before. The audio, from Tantor, was on the “Best Audiobook of 2009” lists from both Library Journal and AudioFile. Chicago has also announced their pick, Toni Morrison’s A Mercy (opening event, 9/7). San Francisco, has chosen Zeitoun by Dave Eggers (runs Sept thru Oct). In June, The Boston Globe revealed a shocking secret; their city has never had a One Book program. So, the Globe held a contest that asked readers to vote on a book every Bostonian whould read. The winner is Dark Tide by Stephen Puleo, a book that chronicles “…one of Boston’s darkest chapters…a gripping narrative about the great North End molasses flood [a molasses tank collapsed] of 1919” and published by local publisher, Beacon Press. The author will appear later next month at the Boston Public Library. The Boston Globe reveals a shocking secret about Boston. They have never had a One Book program. Boston’s not the only major city without an ongoing program; New York ran a program in 2002, but hasn’t held one since. However, Boston will put a toe in the water during the Boston Book Festival this Fall, with a One City, One Story event. 30,000 copies of a short story by a local author (as yet unnamed) will be distributed around the city and made available online. We love seeing good things happen to good books. Chris Cleave’s Little Bee, just out in trade paper, has landed at #3 on the 3/7 NYT Paperback Best Sellers Trade Fiction list. USA Today includes it in today’s “Book Buzz” column; it enters their new list at #22. Exactly a year ago today, we posted a heavy holds alert on the book, shortly after its release in hardcover. USA Today notes that the author, who is from London, is currently on a 20-city tour of the US. One of those stops was Santa Monica, which chose the book as their CityWide Reads program. The program with Cleave, was held this past Saturday. Graves says it was a “smash hit,” with a capacity crowd of over 150. All week, people have been “coming by in droves to say how much they enjoyed it.” As part of the program, the library produced a staged reading, with two actresses portraying the “Voices of Little Bee.” The library also hosted several book discussions, including a live call-in show on the local CityTV, which aired in both Santa Monica and L.A. (for more details, see Graves’ post on the Citywide Reads site; also check out the library’s beautiful resource guide). And, by the way, libraries are still showing holds on the book, although they’ve added copies since we first wrote about it. Further evidence that the graphic format is gaining acceptance; Philadelphia has picked The Complete Persepolis by Marjane Satrapi as their 2010 One City Read. Five thousand copies of the book will be available through the Free Library of Philadelphia. a riveting, deeply moving – and wildly humorous – memoir of the author’s experiences as a girl growing up in the Islamic Republic of Iran, the traumatic years she spent at an Austrian high school, and the growth of her political consciousness as a college student back in Iran. (Satrapi eventually emigrated to France in 1994). a riveting, deeply moving – and wildly humorous – memoir of the author’s experiences as a girl growing up in the Islamic Republic of Iran, the traumatic years she spent at an Austrian high school, and the growth of her political consciousness as a college student back in Iran. It’s not the first time the book has been picked for a One City program. According to the Center for the Book’s database, at least five other communities have picked it, including Seattle in 2006. One Book, One Siouxland picked Dewey for their One Community program. Since the program is just winding up, we asked how it went. The answer, of course, was that it was gangbusters, because the library developed some creative programming around the book. Since Dewey, is not only about a library cat, but also how both libraries and animals help create a community, the library involved several local animal organizations in the program. Vicky Myron, the librarian who wrote Dewey, has written a children’s picture book about her furry friend, to be published by Little, Brown Books for Young Readers in September, which gives other One Community programs the opportunity to expand the age range for a Dewey program. Below is a description of the Siouxland program from Kathy Kelly, Graphics & Communications Specialist, Sioux City Public Library. These ideas may kick-start your own One Community plans. The Dewey book worked especially well for us as it was a local author, a local setting, and a popular book in the first place. The two author signings that launched the program were heavily attended. The topic allowed us to create new partnerships with the local humane society and area veterinarians. In addition, event posters went to retirement communities and pet shops. We invited several organizations to bring therapy dogs to the Library and talk about the healing role animals have. Organizations included STARS (therapy horses) and K-9 STARS (therapy dogs); individuals spoke about certified dogs that visit nursing homes and hospitals, and the use of therapy dogs with troubled juveniles. The Library’s “Read-to-me Story Dogs” program is always popular with the media. (Children of all ages come to the library and read to specially-trained canine listeners). Perhaps a weekly series of these could be planned during a city-wide reading program. How about a “read with your pet” photo display? Or a “pets on parade” day if the season allows outdoor activities? Or a”share your pet-bonding story” blog? We held a few team booktalks, in which a facilitator led the book discussion and a representative from the Humane Society talked about adoption program and other activities. Humane society cats and kittens were passed around from lap to lap at several programs. Be prepared for many ‘favorite pet’stories from participants. The House on Mango Street by Sandra Cisneros is the 16th ‘One Book, One Chicago‘ pick. The book, set in a Chicago neighborhood, tells the story of a Mexican-American teenager struggling to assimilate. Cisneros will appear at the Chicago Public Library on April 14th. The goal of “one city” programs is to get an entire community to read one book. This year, One Book/One Philadelphia is making the homeless a part of the reading community. The book they chose, The Soloist, by Steve Lopez, is about a friendship between the author and a talented homeless musician. The Free Library of Philadelphia has given 600 copies of the book to people who work with the homeless and paperback copies are being distributed through the shelters.